Swiftlet Farming: Million Dollars A Year Income Potential. : Her Last Wish Is To Own & Operate A BH !!! Her Last Wish Is To Own & Operate A BH !!! Something unusual but interesting to talk about. I met an elderly lady who told her daughter that her only wish now is to own and operate a BH. I was on my way to Carey Island BH when I received a text from her daughter who seems to be so eager to meet me face to face. She must have google about swiftlet farming on the net and discovered my blogspot page. I told her to wait for me at Plaza Damas within 1.5 hours so that I can return from Klang. Upon arriving at the location I saw a number of ladies and one of them look elderly. She must be in her 80th but was the one who insisted to meet up with me. Her daughter confessed that her mom came to know about swiftlet farming from her Indonesian maid and bought a piece of land just beside her house in Taiping, Perak. "Pak Harry can you visit the land and tell us the next step?" she asked me. Well the nest weekend I was up there to view the land and put up a visit report about 25 pages. The land looks okay except it was too closed to a number of residential houses. If she can obtain the necessary approval from the local council it will be good to erect one. There was a big pond about 10 meters away from the proposed land and at the same time there was also a BH about 30 meters away from the pond. I described to her that the two plays a very important role if she should erect a BH on the spot she have chosen. 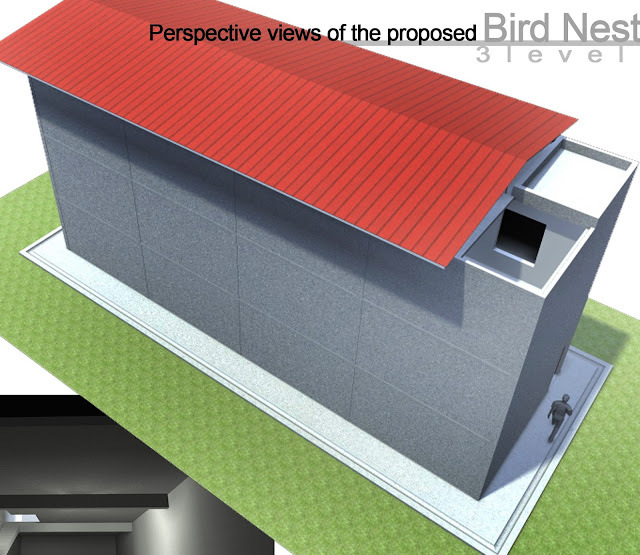 The water will be the best attraction area to those birds especially in the evening while the operating BH will be the young birds generator. She seems to know which direction those birds are returning from. With the flying path in the evening confirmed I describe to her which direction her main entrance hole should be facing. A perfect location with a huge water pond, an operating BH, the morning sun direction and those birds flying home path. The problem on the external sound can be easily tackled. The thing that she needed to do now is to appoint a reliable architect to draw the building plans and submit to the local authority. Once approve she need to appoint a local contractor. I need to visit the architect plus during the building construction three to four time. Once the BH is done I will take over to install those nesting planks and internal gadgets. I hope god will be kind to her. Hopefully she will enjoy to see those nests before she goes. Just After Spraying The Mutiara Aroma !!! What To Upgrade At Carey Island BH Number 1 ??? Time To Start Removing Those Fake Nests !!! Problem With Snake In Your BH!! !